Objectives: Although the number of lung transplants is limited because of general shortage of organ donors, ex vivo lung perfusion is a novel method with 2 main benefits, including better evaluation of lung potential and recovery of injured lungs. The main aim of this study was to establish and oper­ationalize ex vivo lung perfusion as the first exp­erience in Iran. Materials and Methods: This was a prospective operational research study on 5 cases, including 1 pig from Vienna Medical University and 4 patients from Masih Daneshvari Hospital. All organ donations from brain dead donors were evaluated according to lung transplant or ex vivo lung perfusion criteria from May 2013 to July 2015 in Tehran, Iran. If a donor did not have any sign of severe chest trauma or pneumonia but had poor oxygenation due to possible atelectasis or neurogenic pulmonary edema, their lungs were included for ex vivo lung perfusion. Results: A successful trend in the difference between the pulmonary arterial Po2 and the left atrial Po2 was observed, as well as an increasing pattern in other functional parameters, including dynamic lung compliance and a decreasing trend in pulmonary vascular resistance. Conclusions: These initial trials indicate that ex vivo lung perfusion can lead to remarkable progress in lung transplant in Iran. They also provide several important pieces of guidance for successful ex vivo lung perfusion, including the necessity of following standard lung retrieval procedures and monitoring temperature and pressure precisely. The development of novel methods can provide opportunities for further research studies on lungs of deceased donors and lead to undiscovered findings. By keeping this science up to date in Iran and developing such new and creative methods, we can reveal effective strategies to promote the quality of donor lungs to support patients on transplant wait lists. For this method, marginal lungs are perfused ex vivo and then ventilated and monitored during specified time points, during which cytokines and inflammatory mediators are removed by a high oncotic pressure solution (named Steen Solution) to improve performance of the lungs.2,10,11 There are many practical points that should be taken into consideration for achieving successful EVLP. Here, our aim was to establish and operationalize EVLP as the first experience in Iran. This research is a prospective operational study with 5 cases, including 1 pig from Vienna Medical University (Vienna, Austria) in 2013 and 4 human patients from Masih Daneshvari Hospital (Tehran, Iran) from May 2013 to July 2015. All brain-dead multiorgan donors in Tehran were evaluated according to lung transplant or EVLP inclusion criteria. The pig case was used to train the Iranian team in EVLP. Theoretical and practical points including lung retrieval, antegrade and retrograde lung flushing, left atrial and pulmonary arterial anastomosis, cannulations, perfusion, ventilation, and periodic lung assessment were discussed. This study was approved as a PhD dissertation by the Ethics Committee of Shahid Beheshti University of Medical Sciences (number 1392019). Written informed consent was obtained from families of donors. Before the animal study, all protocols were approved by the institution’s animal welfare regulatory com­mittee. Lungs included were from donors younger than 55 year old, with a smoking history of less than 20 packs/y, a ratio of arterial oxygen partial pressure (Pao2) to the fraction of inspired oxygen (Fio2) of less than 300 mm Hg, without any significant improvement by recruitment maneuver, and a chest radiography finding suggestive of pulmonary edema defined as bilateral interstitial infiltration. Exclusion criteria were donor lungs with established pneumonia, severe mechanical lung injury (ie, contusion in more than 1 lobe), or gross gastric aspiration. 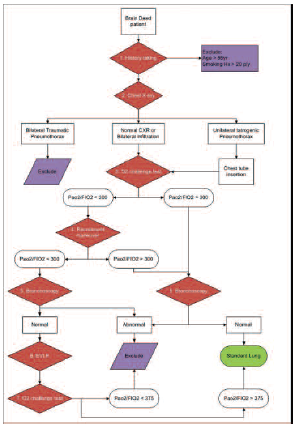 Figure 1 depicts lung evaluation steps for EVLP or standard lung transplant. The circuit was briefly primed with 2 liters of Steen Solution (XVIVO, Vitrolife, Göteborg. Sweden). In addition, imipenem/cilastatin (500 mg, Jaberebne Hayan Pharmaceutical, Tehran, Iran), heparin (3000 IU, Caspian Tamin Pharmaceutical Company, Rasht, Iran), and methylprednisolone (500 mg, Solu-Medrol; Sandoz Canada, Boucherville, Quebec, Canada) were added to the perfusate solution. Table 1 shows the Toronto initiation strategy. After hour 1 of EVLP, 500 mL of circulated per­fusate were removed and replenished with 500 mL of fresh solution. Subsequently, 250 mL were exchanged every 1 hour until the end of the procedure. After lungs were transferred to the XVIVO chamber, the pulmonary arterial and left atrial cannulas were connected to the circuit, and anterograde flow with the perfusate was started at 150 mL/min at room temperature. The temperature of the perfusate was then gradually increased to 37°C. When 32°C was reached (usually in > 30 min), ventilation was started, with subsequent gradual increase of perfusate flow rate. The flow of mixed gas of nitrogen, oxygen, and carbon dioxide (Roham Gas, Tehran, Iran) was used to deoxygenate and provide carbon dioxide to the inflow perfusate via a gas-exchange membrane that was initiated at 0.5 L/min and adjusted according to arterial blood-gas analyses. 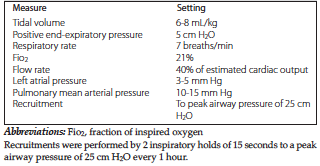 In this method, mechanical ventilation is based on a protective mode with a tidal volume of 6 to 8 mL/kg, positive end-expiratory pressure of 5 cm H2O, respiratory rate of 7 breaths/min, and Fio2 of 21%. Perfusion flow is limited to 40% of cardiac output, pulmonary arterial pressure of 10 to 15 mm Hg, and a left atrial pressure of 3 to 5 mm Hg in a closed circuit. In the final step, the lung block was cooled in the circuit to 10°C over a 10-minute period. Thereafter, perfusion and ventilation were stopped (Fio2 increased to 50% for lung storage), and the trachea was clamped to maintain the lungs in an inflated state. The lungs were then statically preserved at 4°C in Perfadex (Perfadex, Vitrolife) plus 1 vial of isotonic trometamol (Addex-Tham, Kabi, Uppsala, Sweden) solution until transplant. Table 2 shows the Toronto maintenance strategy.12 Figure 2 depicts the circuit diagram, and Figure 3 depicts a lung on the EVLP system. This method was conducted as described in earlier studies.11 The pH, Pco2, electrolytes, and glucose levels were maintained at physiologic levels in the perfusate. For ex vivo functional assessment, the tidal volume was set at 10 mL/kg of donor body weight and 10 breaths/min for 5 minutes, with Fio2 at 1.0. Lung function was evaluated hourly during EVLP according to the following calculations: Po2 = [left atrial Po2 – pulmonary arterial Po2 (in mm Hg)], and pulmo­nary vascular resistance = [(pulmonary arterial pressure – left atrial pressure) × 80] ÷ pulmonary artery flow (in dyn/s/cm5), dynamic compliance (in mL/cm H2O), and peak inspiratory pressure (in cm H2O). Radiography of the ex vivo lung and flexible bronchoscopy were performed at 1 hour and 3 hours of EVLP. We analyzed 5 cases, including 1 pig case and 4 human cases, for the present study. We observed an increasing trend in the difference between the Pao2 and the left atrial Po2 (ΔPo2) in all of the cases. In addition, there was an increasing trend in other functional parameters, including dynamic lung compliance, and a decreasing trend in the pulmonary vascular resistance. Although the observed im­provement trend was acceptable, it did not meet the endpoint, which was a ΔPo2 equal to 350 mm Hg. In the pig, ΔPo2 increased up to 330 mm Hg and lung compliance and pulmonary vascular were ac­ceptable. A 47-year-old donor, brain dead after cerebrovascular accident, was selected as the second case. All cannulations were connected to the circuit, and, instead of Steen Solution, normal saline was injected into the circulation. We observed problems related to the anastomosis, cannulations, air leak, and liquid leak. The third case was a 63-year-old nonsmoker, brain dead after a benign brain tumor. The donor, who was intubated for 9 days with Pao2/Fio2 equal to 125 mm Hg, had pulmonary edema in both lungs and a normal bronchoscopy finding. Ex vivo lung perfusion was started after 130 minutes. The aortic clamp and anastomosis were acceptable, but there were problems with air leak in the circuit and a liquid leak from the site of lung biopsy that was done for the research study. At the end, foamy yellowish secretions, suggestive of pulmonary edema, were removed from the lungs. The ΔPo2 increased from 19 to 110 mm Hg. Pulmonary vascular resistance at first decreased from 780 to 360 but increased to 800 dyn/s/cm5. Improved results were seen in the fourth case, which was a 43-year-old donor, brain dead from hypertension crisis. The donor had a Pao2/Fio2 equal to 220 mm Hg that increased to 260 after the recruitment maneuver, obvious atelectasis in the right lung, and a normal bronchoscopy finding. The lungs had been retrieved at another center, kept in an ice coleman for 1 hour, and finally underwent EVLP at Masih Daneshvari Hospital. The time interval between the aortic clamp and the start of EVLP was 180 minutes. Pressures were kept at an overall acceptable level in this case; however, problems with temperature monitoring were observed, especially during the first 30 minutes. The ΔPo2 increased from 62 to 223 mm Hg. In addition, pulmonary vascular resistance decreased from 350 to 130 at the beginning and then increased to 444 dyn/s/cm5. The lung dynamic compliance improved from 44 to 69 mL/cm H2O and stabilized around 45 mL/cm H2O. For the fifth case, retrieval guidelines were accurately applied; prostacyclin was carefully injected and a sufficient amount of time was spared to let the lungs cool down during retrieval and before the onset of EVLP. However, left atrial pressure of 3 to 5 mm Hg was not met. In addition, due to technical problems, a sudden shift of fluid into the lungs occurred, so the process had to be terminated. Fortunately, the system was successfully set up, and promising results were attained. ∆Po2 in liquid samples increased until it reached 230 mm Hg during hour 5, whereas it was 65 mm Hg at the onset. The details of the perfusion evaluation of third and fourth cases are shown in Tables 3 and 4. This study was conducted to establish EVLP for the first time in Iran. Based on findings for these 5 cases and a literature review, our report provides practical suggestions for achieving a successful EVLP. These suggestions are categorized by phase (before retrieval, during retrieval, between retrieval and EVLP, and during EVLP) and are discussed in detail. It is recommended to recruit brain-dead donors younger than 55 years, with a smoking history of < 20 packs/y. For centers that have limited experience, EVLP can be performed according to our results of the second human case (the 65-year-old donor). No persistent purulent secretion and no sign of severe aspiration should be seen in bronchoscopy. In addition, Pao2/Fio2 must be lower than 300 mm Hg in the arterial blood-gas analysis after 20 minutes of 100% oxygen administration, although it is recom­mended to choose lungs with Pao2/Fio2 between 200 and 300 mm Hg for limited experience centers. If no improvement of Pao2/Fio2 is observed after the recruitment maneuver (mode: pressure control ventilation peak inspiratory pressure of 30 mm Hg, and positive end-expiratory pressure of 15 mm Hg), it would be necessary to continue lung donor management and include the lung as an EVLP candidate. Following standard lung retrieval guidelines for EVLP is very important, and all the following points should be precisely considered. First, 500 IU/kg of heparin (about 30 000 IU) should be injected before retrieval to prevent blood clots in the system, and surface (with ice) and core (with 8°C Perfadex) lung cooling should be initiated precisely afterward to decrease cell metabolism immediately. In the second and third cases, surface lung cooling was imperfect; however, this was achieved completely in the fourth and fifth cases. Intravenous prostacyclin (500 mg) should be administered before aortic clamping to prevent vasoconstriction and pulmonary edema during EVLP. Prostacyclin was not used in our third case, so its absence may have progressed pulmonary edema formation at hour 2. Subsequently, lung antegrade flashing should be completed with 60 mL/kg of buffered Perfadex (Vitrolife) plus 1 vial of isotonic trometamol solution. After the antegrade dose, 200 mL Perfadex should be administered in each pulmonary vein as a final retrograde flush. The trachea and pleura must be dissected perfectly to prevent lung damage. An adequate portion of the main pulmonary artery and the left atrial cuff should be dissected for good cannula anastomosis. A long trachea (at least 4 cm) should be stapled in moderate inflate state. A short trachea may lead to repeated disconnection from the ventilator during the process. In this stage, cellular metabolism is decreased by up to 4 hours with cold Perfadex preservation. The lung surface should be cooled at the time of cannulation. A semi-inflated trachea should be positioned where ventilation starts. The left atrial cannula should be sewn to the left atrial cuff with a 4-0 monofilament to create a closed circuit. Perfect pulmonary artery anastomosis should be performed, and the silicone part of the cannula can be trimmed to fit the left atrium and pulmonary artery. Figure 4 shows cannulation of the left atrium and pulmonary artery. The lung should be placed in the ex vivo lung chamber on the sterile sponge. The cannula should be positioned upright at 60° to 70° with semitraction. The ex vivo lung chamber should be closed to prevent lung drying. Lung washing should be retrograded with 500 mL of Perfadex for the second time to remove clots. Finally, the circuit set should be prepared as shown in Figure 2. For the initiation phase, in situ retrograde lung washing is performed with 1.5 L of Steen Solution through a bridge to de-air the system to fulfill pulmonary artery. A clamp should be placed on the left atrium outflow tube between the hard-shell reservoir and the bridge, and the left atrial cannula should be connected to the circuit. A slow retrograde flow (100 mL/min) should then be administered to de-air the pulmonary arterial cannula, which is connected to the circuit once de-airing is complete. An antegrade flow (150 mL/min or 10% calculated full perfusion flow) should then be initiated with perfusate (1.5 L of Steen Solution + 1 g meropenem + 500 mg prednisolone + 10 000 IU sodium heparin) at room temperature by removing all clamps and reapplying a clamp to the bridge. Afterward, 40% of cardiac output is calculated as a full perfusion. For the maintenance phase, the perfusate flow should be gradually increased over time according to the lung compliance. In case 3, the flow increased only by the time addressed in the protocol without considering the lung compliance acceptance. However, after we reviewed the circuit, it was concluded that lung compliance is a key factor for increasing flow. If this were neglected, it could be harmful and lead to pulmonary edema. Both lung and perfused fluid temperature are increased according to Table 1. Left atrial pressure must be monitored and should be between 3 and 5 mm Hg, adjusted by the elevation of the lung table and the height of the reservoir. Pulmonary artery pressure must also be monitored and should be between 10 and 15 mm Hg, adjusted by positioning the cannula. The trachea should be opened at minute 30 and, after secretions are suctioned, should be connected to the ventilator. A lung bronchoscopy needs to be performed to check the trachea and bronchus and to take samples if necessary. Ventilation should be initiated with a lung-protective strategy that should be at a tidal volume of 6 to 8 mL/kg when the lung temperature reaches 32ºC, with mixed gas flow administered at 0.5 L/min. Mixed gas flow should be increased gradually according to an arterial blood-gas analysis to maintain an inflow perfusate of Pco2 between 35 and 45 mm Hg. Starting the ventilation before the lung temperature reaches 32ºC would be harmful for lung tissue and may induce pulmonary edema. Until minute 60, perfusion flow and tem­perature should be increased stepwise according to Table 1. Arterial blood gas should be checked every hour to assess pH, Pco2, Po2, HCO3, and glucose; a 10-minute recruitment (to a maximum peak airway pressure of 25 cm H2O) is considered before every arterial blood-gas assessment to recruit atelectasis regions. For the correction of acidosis, if pH goes below 7, sodium bicarbonate should be used. In the end, hypoglycemia should be corrected if glucose is below 120 mg/dL. In addition to the important lessons learned in terms of the correct administration of EVLP, other highly valuable points were reviewed to perform a lung transplant correctly for more satisfactory outcomes. The most successful lung transplant teams have reported EVLP success rates of 60% even on standard cases (some countries apply EVLP not only to improve the condition of unsuitable lungs but to promote the quality of standard lungs), meaning that the probability of success with EVLP is 3 of 5 lungs.6 EVLP will lead to great changes and remarkable progress in lung transplants in Iran. Given our team’s experience, it is suggested that this experiment should be continued to achieve successful results in the future. Such services should be supported, allowing for consistency and promotion of quality, to further the ultimate goal of saving human lives. Lung transplant, similar to heart and liver transplant, is a life-giving process known as the last and the only way to save the life of a patient with lung and organ failure. The first and the most important obstacle encountered is shortage of suitable organs. Hence, given the shortage of donors, saving the life of 1 more patient via lung transplant is highly valuable. This lung transplant system by the EVLP method was set up to improve this condition. Providing future financial resources to conduct such research projects will pave the way toward developing novel methods and procedures. These new methods will provide suitable opportunities to conduct research studies on lungs of brain-dead individuals and to unveil unknown complications and mechanisms. Admittedly, such studies should include more samples and be conducted during a longer period of time to obtain reliable and valuable results. Because the aim of our study was to establish this advanced and so­phisticated technique not only in Iran but in the region, the study had to be conducted on a small sample size. Roman MA, Nair S, Tsui S, Dunning J, Parmar JS. Ex vivo lung perfusion: a comprehensive review of the development and exploration of future trends. Transplantation. 2013;96(6):509-518. Cypel M, Yeung JC, Liu M, et al. 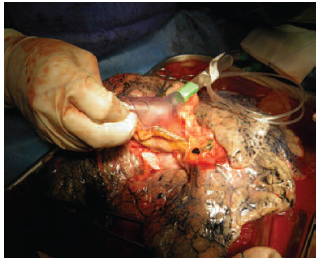 Normothermic ex vivo lung perfusion in clinical lung transplantation. N Engl J Med. 2011;364(15):1431-1440. Arcasoy SM, Kotloff RM. Lung transplantation. N Engl J Med. 1999;340(14):1081-1091. Hornby K, Ross H, Keshavjee S, Rao V, Shemie SD. Non-utilization of hearts and lungs after consent for donation: a Canadian multicentre study. Can J Anesthesia. 2006;53(8):831-837. Punch J, Hayes D, LaPorte F, McBride V, Seely M. Organ donation and utilization in the United States, 1996-2005. Am J Transplant. 2007;7(5 Pt 2):1327-1338. Aigner C, Slama A, Hoetzenecker K, et al. 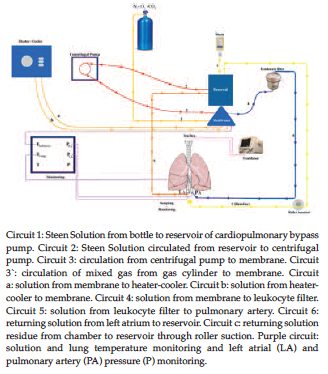 Clinical ex vivo lung perfusion—pushing the limits. Am J Transplant. 2012;12(7):1839-1847. Pêgo-Fernandes PM, Medeiros IL, Mariani AW, et al. Ex vivo lung perfusion: initial Brazilian experience. J Bras Pneumol. 2009;35(11):1107-1112. Trulock EP. Lung transplantation. Am J Resp Crit Care Med. 1997;155(3):789-818. Hosseini Baharanchi FS, Hajizadeh E, Najafizadeh K, Baghestani AR, Shafaghi S. Risk factors associated with survival after lung transplant in Iran. Exp Clin Transplant. 2014;12(4):290-294. Steen S, Ingemansson R, Eriksson L, et al. 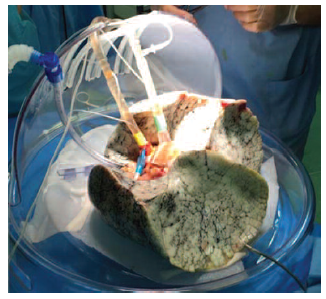 First human transplantation of a nonacceptable donor lung after reconditioning ex vivo. Ann Thorac Surg. 2007;83(6):2191-2194. Helwick C. Ex vivo lung perfusion yields good donor lungs. Medscape, April 15, 2011. Cypel M, Yeung JC, Hirayama S, et al. Technique for prolonged normothermic ex vivo lung perfusion. J Heart Lung Transplant. 2008;27(12):1319-1325. Acknowledgements: The authors declare that they have no sources of funding for this study, and they have no conflicts of interest to disclose. The authors thank Masih Daneshvari Hospital, Vienna University of Medical Sciences and the Board of Trusties for Patient Treatment, Heyat Omana Arzi, for their considerable contribution to this study.